Gender-binary restrooms: a social problem with a design solution? - Archpaper.com Gender-binary restrooms: a social problem with a design solution? Gender-binary restrooms: A social problem with a design solution? The deeply embedded practice of designing gender-segregated restrooms may feel like the norm to many, but in recent years, transgender and gender-nonconforming individuals and the organizations that support them have voiced the everyday discomfort and sense of alienation felt by those who cannot use the restroom of their choice in public spaces. They point out that gender-segregated facilities inherently exclude people who might not conform to stereotypical gender definitions or modes of expression. Moreover, research shows that transgender and gender-nonconforming people of color specifically suffer under this status quo at disproportionately higher rates: both in terms of the health impacts resulting from not using the restroom for long periods of time and by experiencing violence in public restrooms. As this form of inequality gains a wider understanding, architects and designers must decide whether they wish to perpetuate inequality through their designs or advocate for change. The bathroom layout is among the first aspects of a building to be considered. The notion of a shared “wet wall” with gender-segregated plumbing facilities located on both sides is seen as a fundamentally efficient arrangement for a variety of building types. This prototypical approach is also perceived as being cheaper to build. But what is typically considered a perfunctory and banal aspect of design, contingent mainly on code-required fixture counts and wheelchair-turning radii, is actually ground zero for the perpetuation of gender-identity discrimination. That’s because this automatically embeds gender segregation into architecture from the onset of a project’s development and furthers what is increasingly being viewed as an unequal and discriminatory cultural mind-set through design. 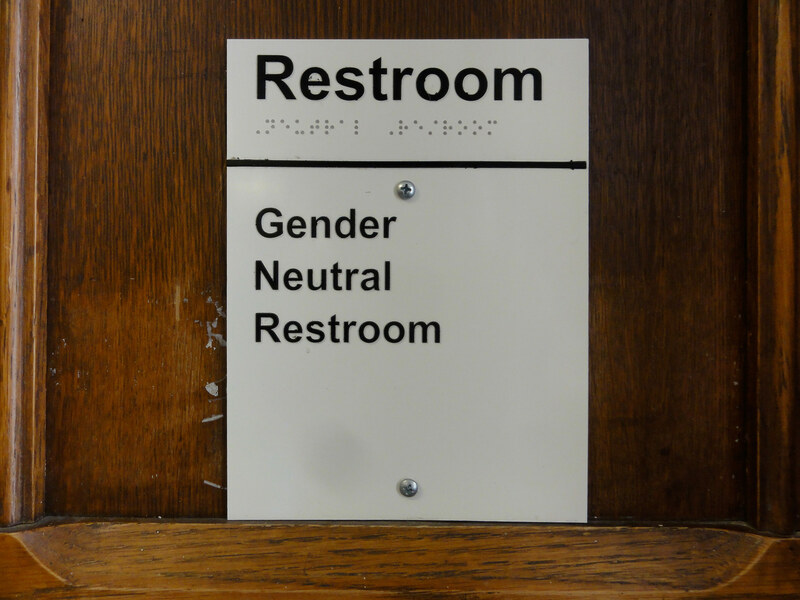 facilities to gender-neutral ones by removing placards demarcating binary gender identities. Columbia University and Barnard College in New York City began converting existing, single-occupant restroom facilities in 2013. The University of California system followed suit in 2014 with a similar plan across its ten campuses with 238,000 students. Coincidentally, designs for wholly new gender-neutral facilities bear much resemblance to those at Santee High School. Authorities on the politics of gendered bathroom design like Sanders and Stryker agree that multistall, gender-neutral facilities are the future of nongendered restroom design and even have the potential to be safer than traditional bathroom configurations. These configurations are already common in certain European countries, as well as many high-end establishments. Designs vary, but these restrooms typically feature a collection of individual, lockable water closets accessible from an atrium containing shared washbasins, allowing a steady and diverse flow of people to come into and out of restroom facilities. These designs, however, are exceptions in an otherwise gender-segregated architectural culture and will not become part of a wider societal change unless building codes change in toe with social mores. According to advocates, these designs, if widely adopted as part of a new set of building codes and regulations, could herald a new era of gender equality in architecture.